C. H. Clark : Wake Surfing, Hudson River, 1919. 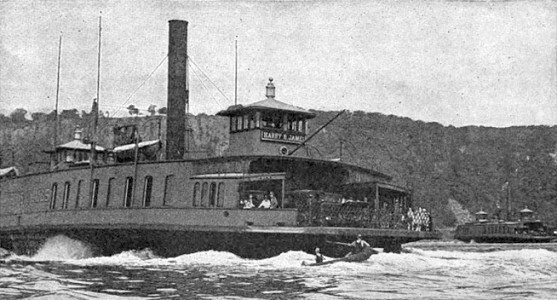 C. H. Clark: Coasting in the Wake of a Ferry Boat. This article is remarkable in detailing Clarke's daring and skill in surfing the wake of a large paddle-steamer on the Hudson River, but also the a basic explanation, with illustrations, of the mechanics of wave riding. of a side-wheel ferry boat. see the odd spectacle of a canoe sailing in their wake, all the way across, without any apparent means of propulsion. Only occasionally do the occupants of the canoe dip a paddle into the water to steady the craft and keep it on its course. What makes the canoe go, is a question that has puzzled many a one. have noticed that the canoe does not keep to the comparatively smooth water directly aft, but rides off to one side in the rough waves that are kicked up by the paddle wheels; also that the canoe does not hug the ferry boat closely, but may pursue its mysterious course at a considerable distance, while travelling just as fast as the ferry does. Sometimes the canoeist rides an eighth of a mile behind the ferry boat. There is no hidden power plant in the canoe, and yet the how wave that it makes as it speeds along shows that it is not carried along on a current of water. Another point to be noted is that the canoe always takes a position on the forward side of a wave, and that it holds this position all the way across. This lets out the secret for it is the wave that carries the canoe along, in the same way that the Hawaiian on his surf board rides at high speed for half a mile or more on the waves that roll shoreward. This does not mean that a current of water carries him forward, but that the waves do. The tide may be setting out and yet if the waves roll shoreward the surf board will go in on them despite the outgoing tidal current, because it is the waves that push it along. To illustrate the phenomenon, imagine a marble on a carpet. If the carpet is wrinkled by pushing it forward with the toe the marble will roll along ahead of the traveling wrinkle in just the same way that the surf board glides along pushed by the advancing waves. Of course the surf board does not roll, but it is pushed ahead just the same. Perhaps a more apt comparison is presented in the accompanying sketch of a bottle and a ruler. Lay a bottle on a table top and support one end of a ruler on it. Now if the bottle is rolled forward the ruler will slide ahead, just as the marble did ahead of the wrinkle in the carpet. The same is true of the canoe, which is shown in the same cut. The canoe stands in an inclined position on the side of the wave. As the wave advances to the position shown in dotted lines, the canoe must advance also. It cannot ride over the wave without running up hill and consequently it must be pushed along by the wave. The man who has been performing this interesting experiment is Mr. C. H. Clark. Occasionally he makes the trip alone but our photographs show him accompanied by Miss Frances Ketchman. Mr. Clark informs us that one of the ferry boats he follows, makes a speed of about 12 miles per hour when under full head-way. Directly back of the ferry boat there is a suction producing a current of about two miles per hour in the direction in which the boat is traveling. Back of each paddle-wheel there is a current in the opposite direction, of about three miles per hour. The waves are produced by the water lifted up by the paddles above the normal level. The water then drops and continues to oscillate up and down. Right at the paddles there is also a quantity of water that is being lifted up. direction as the ferry boat travels and at precisely the same speed, as long as the paddle wheels are running. Although there is this forward motion of the waves at 12 miles per hour, there is a rearward current of three miles per hour, so that the canoe which travels on the waves must actually go through the water at 15 miles per hour, as long as it keeps up with the boat. It seems odd that the canoe can overcome this rearward ﬂow, but the action will be clearly understood if we refer again to the marble on the carpet. Suppose that the wrinkle is produced by a. ruler that is moved along under the carpet and that while the ruler is moving forward the carpet is being drawn rearward. The marble will still continue to slide forward ahead of the wrinkle. This is exactly what the canoe does. There is not enough rearward current to carry it uphill over the crest of the waves and as long as the craft lies on the forward side of the wave it must progress with the wave and at the same speed as the wave. matter of fact the rearward current helps to maintain the canoe on the side of the wave and to prevent it from burying its nose in the trough of the waves. All that Mr. Clark has to do is to paddle his canoe to the proper position on the wave that he selects and then he may fold his arms and lot the ferry waves carry him across. It is a surprising fact that he usually beats the ferry across, because when the ferry slows up the paddle wheels act as brakes and the waves which they have set up travel ahead of the boat carrying the canoe along with them. 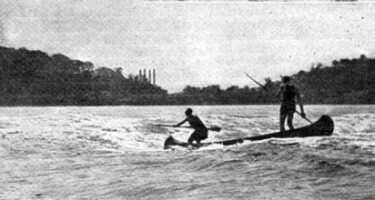 Although the occupants of the canoe like to indulge in feats of daring such as standing up in the light craft, as shown in our illustrations and performing various stunts, yet riding ferry boat waves calls for a . considerable degree of skill and should not be attempted by any one but a strong swimmer. Snapshots of the canoeists riding the waves thrown up by the paddle-wheels of a ferry boat. In the picture above note the side slap at the bow, one of the dangers of this sport. well to the rear of the ferryhoat. on the side of a wave. 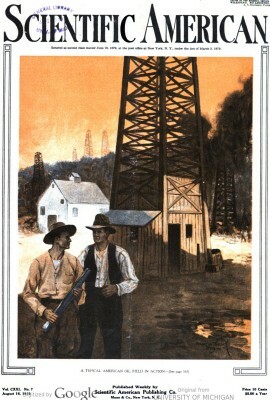 All photographs on this page by Edwin Levick. the smoothness of the waves. There may be a side slap on the bow of the canoe that will throw it of its course, turn it around in the trough of the waves and upset it. The canoeist. must be constantly on his guard to avert any such dangers. Mr. Clark makes the interesting suggestion that in towing a small boat behind a vessel that is throwing up a considerable wave it is advisable to draw the boat to such position that it lies on the forward face of the wave instead of in the rear face of the wave, so that the wave will push the boat along and there will be scarcely any strain on the towing line. Experiment with a ruler an a bottle, showing how the wave pushes the canoe along. Currents in the wake of a ferryboat. Geoff Cater (2017) : C. H. Clark : Wake Surfing, Hudson River, 1919.